An engaging writer-reader with presence. That was Blast Furnace's takeaway when we first encountered poet / writer Lauren K. Alleyne back in our graduate school days, when Lauren visited Pittsburgh by invitation to interact with aspiring creative writing students and, later in 2008, read her poetry from a little student-published chapbook of her work. Since that time, she has become an assistant professor; most recently, Assistant Professor of English and Poet-in-Residence at the University of Dubuque, Iowa. Among her accomplishments: several prizes and awards, including Lauren's essays and poems have been published in several journals and anthologies including an Atlantic Monthly Student Poetry Award, The Small Axe Literary Review Prize, two Dorothy Sargent Rosenberg awards, and a Lyric Iowa prize. And as of 2014, her first full-length book of poetry, Difficult Fruit, was published by Peepal Tree Press Ltd. 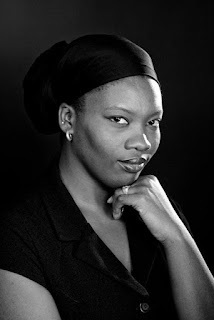 Readers may have also read her work in past issues of Crab Orchard Review, Black Arts Quarterly, The Caribbean Writer, The Cimarron Review, Growing Up Girl, and Gathering Ground, among other literary journals and publications. A Cave Canem fellow, Lauren was born and raised in the twin island Republic of Trinidad and Tobago. We had the pleasure of connecting with Lauren here in the States early this month to ask about her home, history, book, craft, and passion. How old were you when you moved from Trinidad and Tobago, and what prompted the move? Do you return to Trinidad and Tobago often? I left Trinidad a month after my 18th birthday. I'd received a scholarship from St. Francis College in New York City, and was excited to embark upon my big adventure! Back then, I couldn't afford frequent trips home, but being a grown-up has its perks, and I do get home with some frequency. Home also comes to me sometimes, and I have visits from family and friends wherever I am, which is great! When did you first realize you were talented in writing? The truth is I was a precocious little girl—a fast-talking, story-telling, little chub-a-lub. I remember one time my parents did the thing that parents do and spelled out a word, and I was like, why are you spelling chicken? And I remember the way they looked at me. I got that look a lot when I was younger, always had grown-ups being amazed by the words I said, which, apparently, I wasn't supposed to know yet. I remember a day in elementary school, when my teacher accused me of not having done my own homework, and quizzed me on the meaning and spelling of the word "enormous." I was 5 or 6, and thought it all very silly; I rattled off the letters and definition, while her face took on that same expression. She went on about how I would be a writer. The thing is I never thought I was doing anything that great, I was just doing what came naturally. What sort of writing practices or exercises do you savor? Which are the most challenging for you? I love writing in form. I find it consoling to have the constriction of rules to hold the poem in. I enjoy the ghazal and have been known to write (often awful) villanelles for fun. But writing a poem is itself challenging, I don't know that I've ever written an easy poem—and I think that's a good thing! Talk about your experience with Cave Canem. How has it further contributed to your love for writing and poetry / literature? Cave Canem is without a doubt one of the most significant events in my writing life. It's called a "home for black writing" which is absolutely true, but when you're as far away from your family/culture/country as I was back in 2004 when I had my first Cave Canem retreat, a space to call home is even more meaningful. I met strangers who became colleagues, mentors, friends, and yes, family. Cave Canem is founded on the brilliant and simple notion that to nurture black writing, you have to nurture black writers—to see, honor and engage the diversity of experience that is us. In a space like that—one that is safe, encouraging, vibrant, thoughtful, creative, and fun—you open up. That opening made me a better person, and a better writer. I will always love and support Cave Canem for that gift. When did you know your manuscript for Difficult Fruit was ready to be submitted? Ha! That's a great question. I didn't. I'd been submitting the manuscript for years—it had different names, different poems, at one point it was twice as long; it was literally a different book by the time it arrived in the hands of my editors over at Peepal Tree Press. The last time I sent it out, though, I was on the verge of tears because it had been the runner up for the Cave Canem poetry prize, which was an honor, but the book had been a finalist several times prior. I was at my wits' end, trying to determine what would give it that final push. My best friend, and best reader, Catherine Chung and I sat down to do one final edit, and we were ruthless. We started at the first page (the title was different, too, at that point), and changed, cut, reordered, and then I sent it off with a prayer. Maybe that's what did it, but that last time stuck! Which of your poems is currently one of your favorites to read and why? I really enjoy reading the poem 'Fifteen,' which is a letter to my 15-yr-old self reassuring her that life is going to turn out just fine. I love reading that poem because the occasion itself tends to justify the argument the poem is making, which is that my younger self could have had no inkling that this is the future that awaited her—how could she? It reminds me to be grateful, and to appreciate the amazing trajectory that took a girl from a tiny village on a tiny island and took her all around the world reading poems! Whose poetry do you love to hear performed or read in person? Two poets whose work I love most when it comes through their physical bodies are Patricia Smith and RogerBonair-Agard. Patricia is Queen of Voice—I don't know another poet who can make a voice carry so many nuances of emotions simultaneously. It's like she has an orchestra in her throat. She doesn't move much on stage, but moves her listeners by the sheer power of her vocal modulation. It's astounding. Roger is all about the energy, you can literally see the poem moving around in his body when he performs--he's a very physical presence, and is basically a definition of the word "embody." He doesn't read a poem. He becomes it. What qualities in poetry move you the most? I love poetry that moves me. I'm not interested in verbal pyrotechnics, in shuffling words like they're a deck of cards and seeing what they turn up. I am interested in poems that harness the immense power inherent in language, and use that power to enlarge, deepen, and connect to the human spirit. Where can people see / hear you read your work? For archives of previous readings, and to order copies of my book, visit http://www.laurenkalleyne.com. I'm pretty active on my facebook author page, and that's where you'll find more up-to-the-minute notifications.